PyCon UK is the UK conference for the Python programming language, held annually at Coventry. PyconUK is attended by many professional developers, but has recently added an education day to the line up. 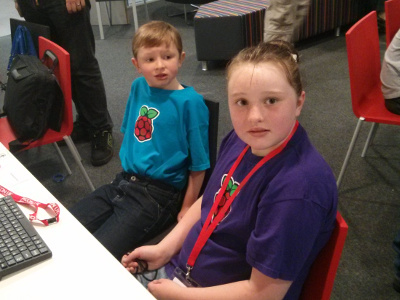 Last year was the first day that kids were specifically invited through the PyCon UK Raspberry Jam. For 2014 this evolved into the PyCon UK Education Track a two day event running concurrently with the main conference. The first day (Friday) was for teachers and the second day (Saturday) was for children. The kids day cost only £5 per child (accompanying parents free) which was excellent value for money considering it included lunch and a goodie bag. I attended with my two children, Amelia (9 years old) and Oliver (6 years old). My daughter had also attended the previous year, but this was my son's first time. The day started at 9.30. After a welcome to the event Martin O'Hanlon (one of the authors of Adventures in Minecraft) gave a presentation on programming for the Raspberry Pi Minecraft API. His presentation had an instant impact on the children who were clearly impressed by the ability to build a city of houses or having a house that follows behind and of course the canon to blow up his windmill. The children were then provided with a worksheet on programming the Minecraft API. This started with a simple message on the screen and build up to an automatic bridge that would appear wherever Steve walked. Whilst Oliver has been working through the Code Club Scratch programming (he's my guinea pig for preparing for the code club I'm running at the moment) this is the first time he's seen Python. He didn't like the typing involved, although that's understandable considering he's quite young, but enjoyed the testing part. Amelia did most of the actual typing and together they to work through the exercise finishing just in time for the next session. For the next session we had a choice of different activities. Initially I was thinking of taking Oliver along to the lego robot session (he's a big lego fan), whilst Amelia went to the Stop Motion session run by the Raspberry Pi education team. Due to technical problems the lego robot session was not running as planned (although I believe some of the kids still managed to get some lego robot stuff working), so both my children went up to the Stop Motion camera. Amelia had gone ahead already and had made friends with another girl, so they partnered up. I could therefore work one-to-one with Oliver. 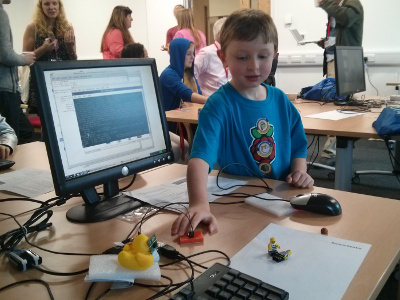 There were also sessions on PyGame (for the older children) and programming Quad-copters. The Raspberry Pi education team ran the second session that we had. This included Carrie Ann Philbin (author of Adventures in Raspberry Pi), Ben Nutall (author of much of the Raspberry Pi website documentation) and Alex Bradbury (one of the authors of Learning Python with Raspberry Pi) talked us through the steps involved in creating a push button stop motion camera. This involved wiring up a button to the GPIO and adding some Python code using the picamera module. The trickiest part of the setup was how to mount the camera so that it didn't move around. We used a PyCon UK rubber duck to create our own "Duck Cam". Oliver didn't want to do any typing, but other than entering the code this was very much a hands-on and do activity which he responded to really well. We were able to get up and running quite quickly and in no time had our first animation using some lego figures. We then had a play with some jelly beans which danced around the table before mysteriously disappearing (I'm not sure where, but they were very yummy). We finished with a funny face video. During this Amelia was being helped along with a volunteer. I think he may have been one of the teachers from the previous education day that had come to help out. It took them longer with the girls doing the typing, but they managed to create their own video by the end of the session. It was then time for lunch with a demonstration of some robots. 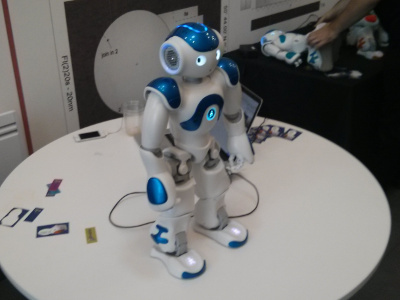 These robots were well out of the budget for most homes and schools, which is a really shame as they were very cool! Hopefully in future they will come down to a more reasonable price, but until then this was a rare chance to see them in action. The afternoon was an opportunity to carry on with one of the previous activities or to have a go at something else. My children teamed up together to work on another stop motion video. This started with them trying to find as many Simpson / Lego movie figures from the Raspberry Pi's Lego box and then making up a short story. The story involves a Lego spaceman and Lisa Simpson building a wall, that is promptly destroyed by a girl robot, who is chased away by Chief Wiggum on a motorbike. Wyldstyle then comes in and with a bit of Master Builder know-how rearranges the Lego, which turns into a real life Raspberry Pi, which the Simpson cast all come to look at. Awesome! As well as the programming aspect to this, it's a great example of how computers, especially the Raspberry Pi, can be used for other creative projects. A great way to combine art and computing. At the end there was an opportunity for some of the children to show off their work. The event was well turned out and many of them wanted to show off their work. Unfortunately there was not enough time for everyone, but there were some great demonstrations. This included several Minecraft demonstrations (such as a "Tardis" style building that was bigger inside than outside), some PyGame mazes and some of the videos from the earlier stop motion session. Oliver's funny face video was one of those shown which raised a few laughs! As well as all the fun of day the children all took home a bag of goodies to help encourage them to learn programming at home. This included a Raspberry Pi (the latest model B+ no less) and a copy of the book Getting started with Raspberry Pi, a debugging duck and some Pycon swag. This means that the children can go home and carry on the programming they started and hopefully encourage them to pursue it further. We returned one of the books as there were not quite enough for all the kids and my kids were happy to share, but they did get their own Raspberry Pi to encourage them to create their own projects. A great day that all the kids enjoyed. Thanks to all those that put in so much effort to make the day go so well.